The specially-adapted Fiat prototype, which was presented at a European technology show, can tell garage staff about the state of its components in seconds by using electronic tags inside its engine. The system has been designed by academics at the Institute for Manufacturing, part of the Department of Engineering. In conjunction with sophisticated software, it could be used to speed up servicing, and identify which parts can be recycled or reused when the vehicle reaches the end of its life. Combining such information from many vehicles would pinpoint which parts of a car need redesigning. In those rare cases that a faulty batch of cars are actually sent to showrooms, the technique could instantly single out which models need to be recalled before they hit the road. 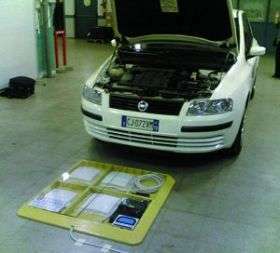 Radio-Frequency Identification (RFID) tags, each with its own unique identification number, are attached to the car’s engine parts. The vehicle is then driven at low speed over a one-metre square servicing pad, which is fitted with an Ultra-High Frequency reader and four antennae. As the car passes over the pad, the readers transmit the ID number from the electronic tags to a computer. By cross-referring this information with a computerised database – for example one showing the parts’ date and manufacturer – mechanics would be able to identify those parts that needed to be checked for wear at the click of a mouse. Professor Duncan McFarlane, from the University of Cambridge’s Institute of Manufacturing, said; “Ultimately motorists could be driving into a garage over the same sort of sensor, which would instantly tell both the driver and the garage staff which parts needed replacing and which might be good for several thousand miles more. This demonstrator forms part of a EU funded project called ‘Product Lifecycle Management and Information Tracking Using Smart Embedded Systems’, conveniently abbreviated to PROMISE. The system has already been demonstrated at Fiat’s research centre in Turin.